Congratulations to Mr. Daly’s 4E class on achieving the Green Flag for Loreto Balbriggan. The Green Flag will fly proudly in the new academic year. 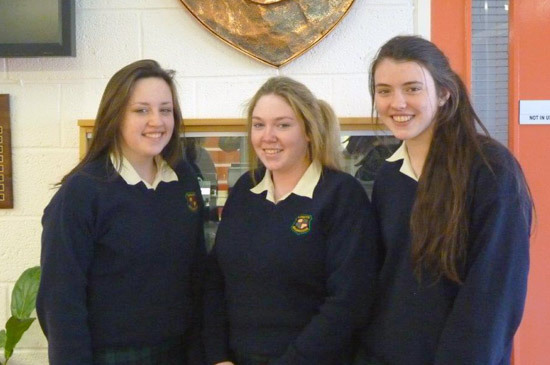 Fifth Year Outstanding Academic Achievement Awards - Eilise Everard, Nadia Grimes, Roisin Lacey. 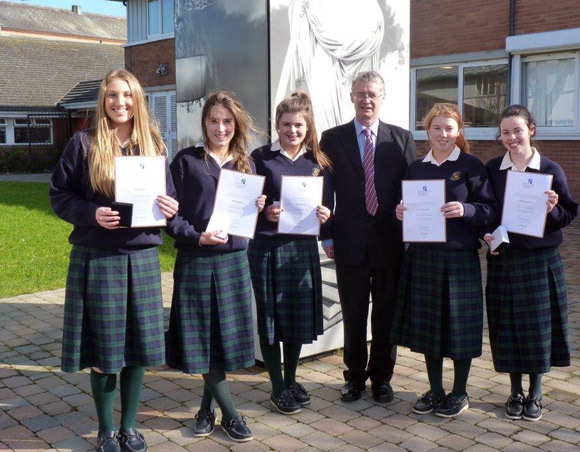 Sixth Year Outstanding Awards - Lauren Kennan, Megan Weston, Sophie Donnelly, Elizabeth Atkinola. First Year Outstanding Academic Achievement Awards - Emma O’Carroll, Aoife Conroy, Kelsey Wilson, Sophie Weldon, Nisha Teeling, Maeve Cope, Niamh Daly, Mairead Ni Chleirigh. 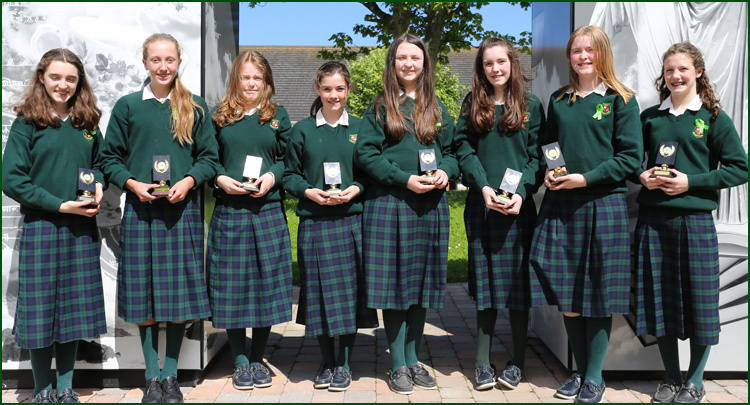 Second Year Outstanding Academic Achievement Awards - Grace O’Driscoll, Katie Connell, Orla Thompson, Caoimhe Curnyn, Mia Doran, Marie Louise Fufezan, Sarah Ryan, Ellen O’Driscoll, Maya Brezing. Third Year Outstanding Academic Achievement Awards - Saoirse Delaney, Dargile Puidokaite, Laura Gorman, Renuka Chintapalli, Cara Devlin, Aimeerose Lumsden, Tess O’Neill, Khadija Gull, Megan Dinsmore. 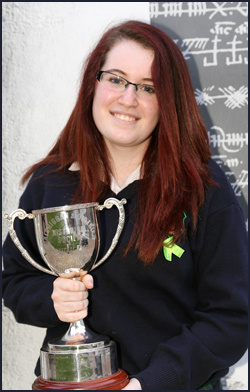 Junior Student of the Year - Cara Devlin. Junior Music Student of the Year - Megan Dinsmore. 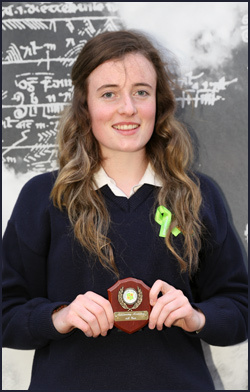 Junior Sportsperson of the Year - Caoimhe Dunne. 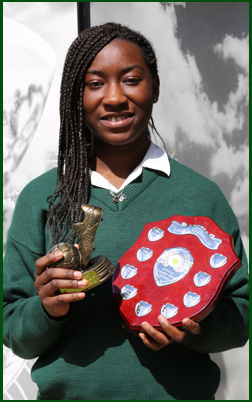 Golden Boot Award - Claudia Andre. 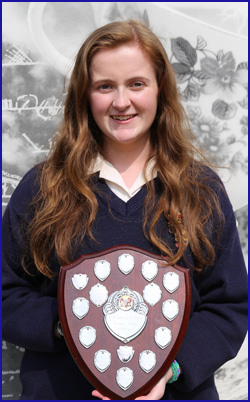 Junior Mary Ward Person of the Year - Eimear McCausland. 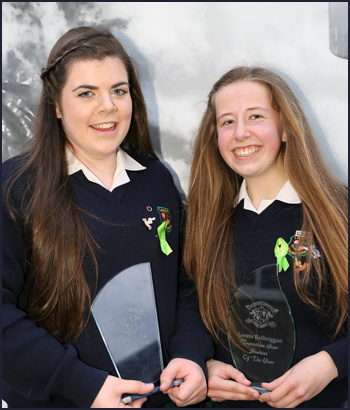 Transition Year Student of the Year - Julie O’Connor & Niamh Rothwell. 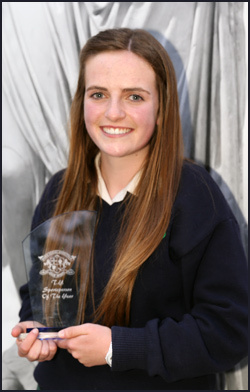 Transition Year Sportsperson of the Year - Laura Browne. 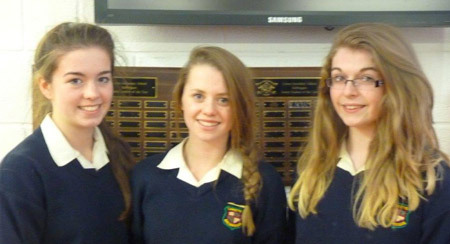 Transition Year Outstanding Academic Achievement Awards - Sabrina Grigore, Lisa Flynn, Naomi Clare. 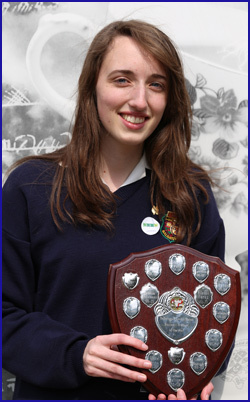 Transition Year Mary Ward Person of the Year - Megan Wilson Griffin. All students (except 3rd & 6th Years) are taking their end of year examinations over the last week of this term. Congratulations to the school tennis team on coming runner up in the Loreto Tennis Competition on Wednesday. Well done also to the camogie team on their performance in the Dublin quarter final. Hard luck to the U-15 soccer team on losing narrowly in the Leinster final. A group of TY students availed of the opportunity to visit DELL Computers. The girls got a tour of the state of the art Computing centre in Cherrywood and got a good sense of what it is like to work in IT. 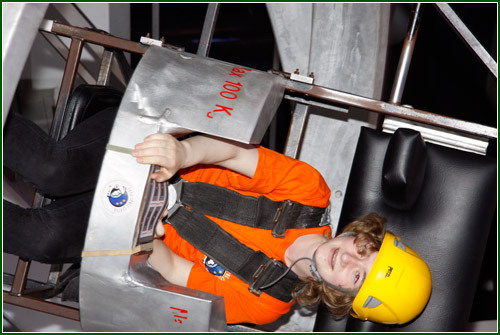 The trip was part of DELL's outreach programme 'IT - It's not just for Geeks'. Many thanks to DELL, and in particular Elaine Collins for her wonderful guidance and encouragement to the girls. 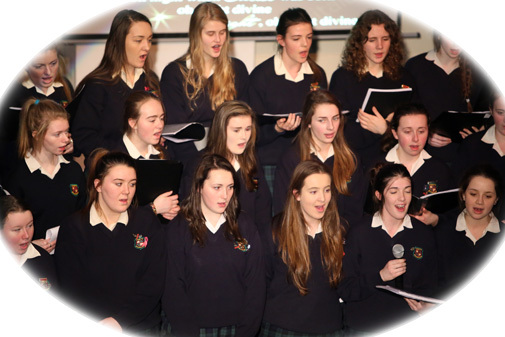 A wonderful Ceol Loreto Gig took place on Thursday evening. An array of acts ranging from choirs to groups and individual performances entertained the audience. The outgoing Music Captains – Deirdre Cleary, Aideen Foley, Hannah Egan, Alice Kiernan, Aideen McNally & Naoise Whearity were congratulated on their work during the year. 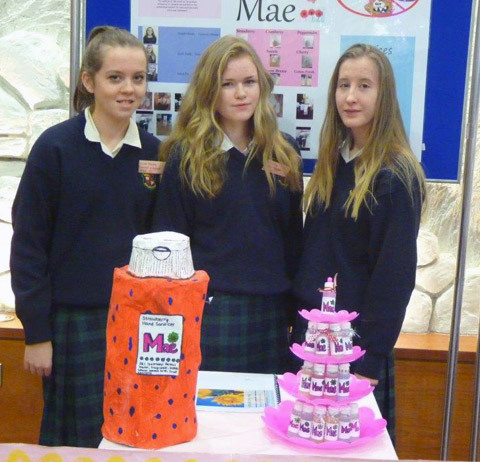 The One Good Idea group won the senior section of the national finals in the Mansion House on Friday. The girls were complimented on their work, their creativity and presentation. 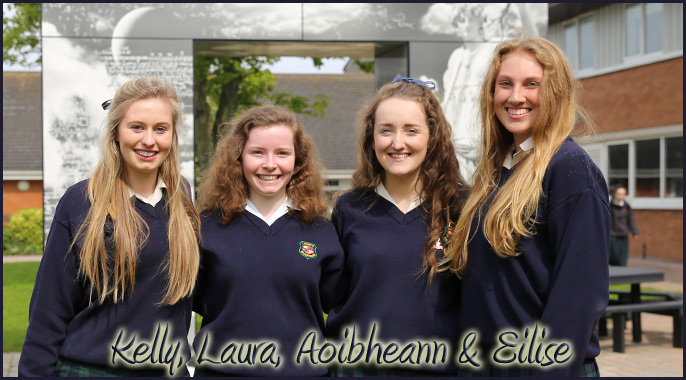 The new Head Girls for the 2014-15 academic year are: Head Girl – Aoibheann Corcoran, Deputy Head Girls – Kelly Domigan, Eilise Everard & Laura Hennelly McCarthy. Well done to all our athletes in the Leinster Athletics on Tuesday. 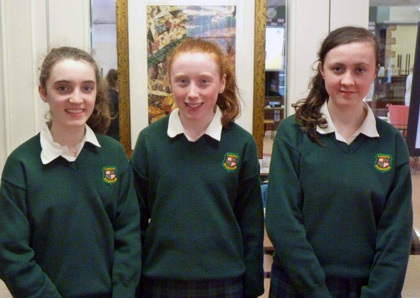 They were Claudia Andre, Hannah Tully, Eibhlin McCarthy & Lauren O’Keeffe. 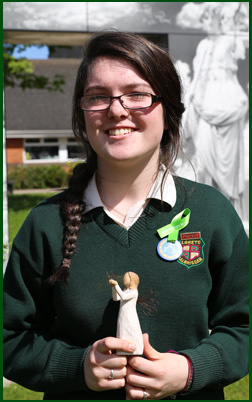 Lauren won gold and broke the Leinster Record for the hammer throw. Congratulations to the school tennis team on coming runner up in the Loreto Tennis Competition on Wednesday. Well done also to the camogie team on their performance in the Dublin quarter final. 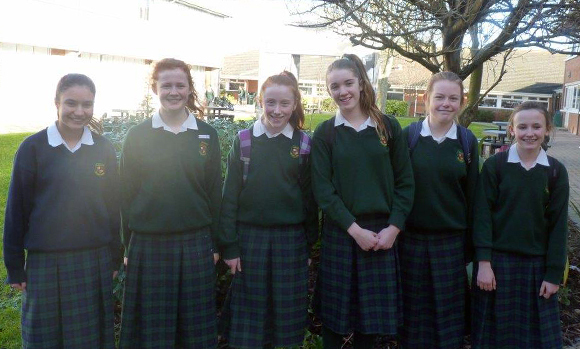 A big congratulations to the six First Year students who were finalists in the Irish Junior Maths Competition organised by the Maths Teachers Association of Ireland. The finals were held last Friday 9th May at Castleknock College. The girls scored highly in the final and Celine Schmid won the overall 1st Prize. Well Done Girls, we’re very proud of you! 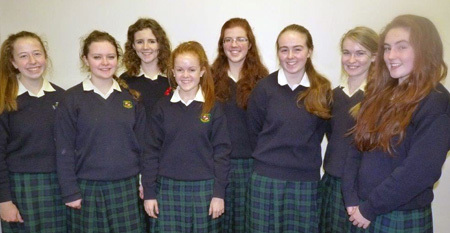 Leanne Keeling, Sarah Burke, Clodagh Gillen, Hazel Lattimore, Celine Schmid and Emily Bell. 5A enjoying a positive breakfast in RE class. "A positive start makes a positive day" was the motto. Congratulations to all our participants in SciFest. Three First Year groups were involved. 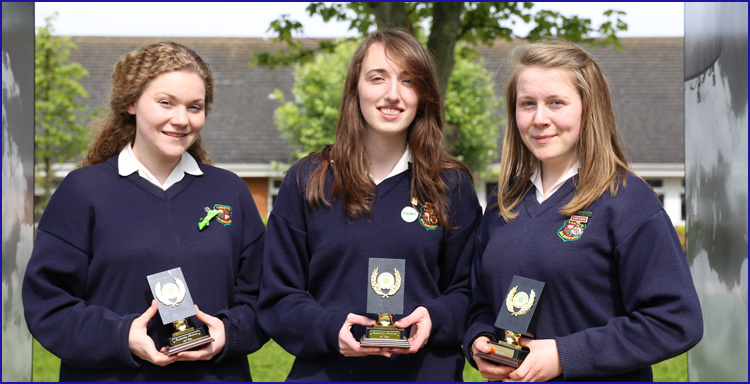 Aoife Conroy, Lauren Murphy and Kate O’Kelly who were runners up in Life Science. 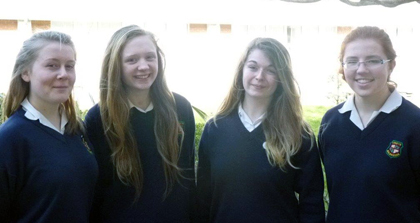 Highly complimented were Hannah Rudden, Anna Sowray and Kelsey Wilson. Also highly praised were Roisin Sherry and Daire Stafford. 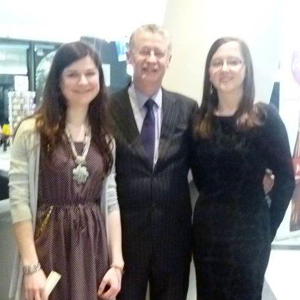 Well done also to Megan Dinsmore and Eimear McCausland on being runner up in the John Hopkins Statistical Poster Prize. The girls have already had success in the Young Scientist with their topic. Well done to our First Year student team (Emily Bell, Maeve Cope, Hannah Dalton & Megan Wearen) on winning the University Challenge at the Salters' Festival of Chemistry in Trinity College. 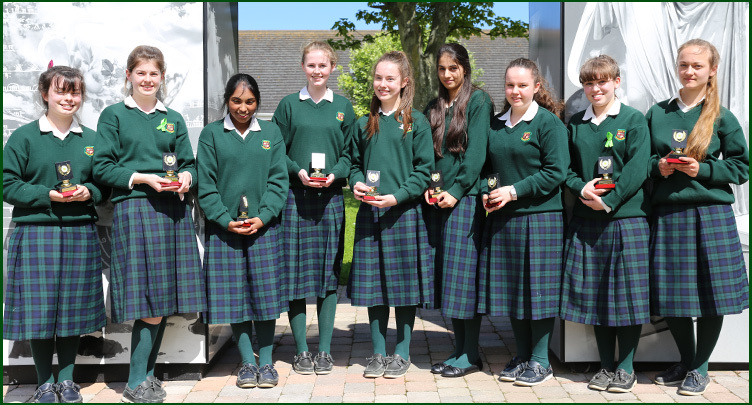 Also, well done to our two Third year teams ( Khadija Gull, Tess O'Neill, AimeeRose Lumsden, Renuka Chintipalli, Saoirse Delaney, Sarah Kearney ) on their strong performance in the ISTA School Science Quiz. They narrowly missed a place amongst the prize winners. Interviews for Student Leadership took place this week. Transition Year interviews in relation to Assessments also occurred. 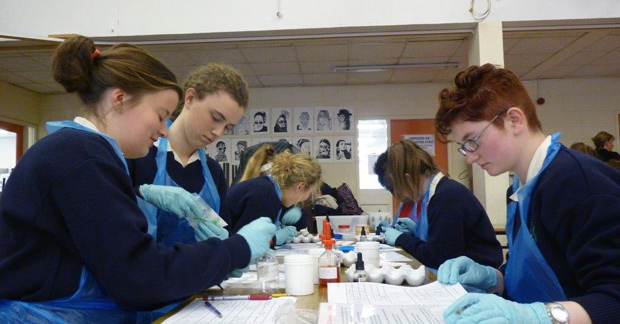 Transition Year Forensics have had a day long interactive presentation from Susan McGrath (Science/Forensics expert). 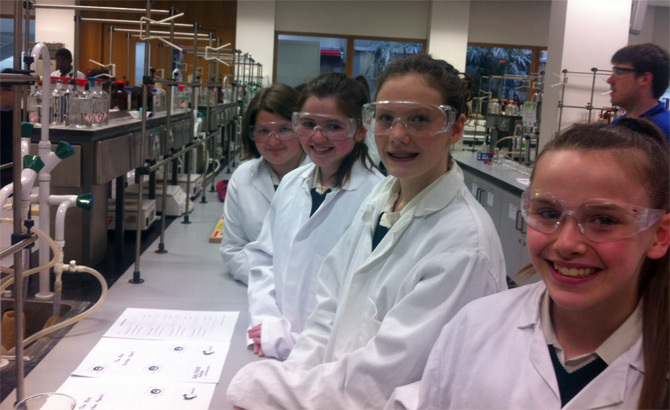 The girls were involved in a wide variety of Forensics related activities. 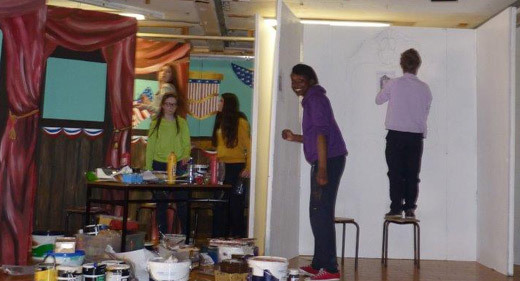 Junior and Leaving Cert Practical Art Examinations took place this week. Well done to our tennis teams on our matches this week. Well done also to our camogie team on their matches. A Transition Year group began the pilot BodyRight programme this week. Congratulations to the school’s Science Department on winning the prestigious national PharmaChemical Ireland Industry’s award for Science Teaching. The Science teachers were complimented for their great work over a number of years in teaching and learning, Young Scientist, SciFest and One Good Idea Competition. Well done to the Mock Trial Group who were the runner up in the Court of Criminal Justice final over the Easter period. 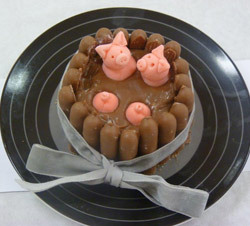 The girls excelled and were highly praised by the judging panel. 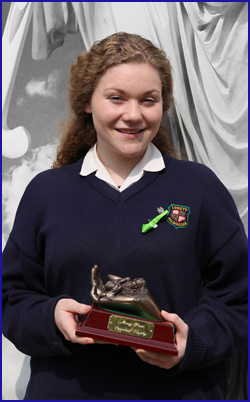 Congratulations to Mia Doran who won the Loreto Junior Public Speaking on Tuesday. Mia’s topic was “Reason to be Cheerful”. Fifth year students are having their Irish Oral examination this week. In order to replicate Leaving Certificate conditions outside examiners mark the students. Well done to both the football and athletics teams this week on their performances. 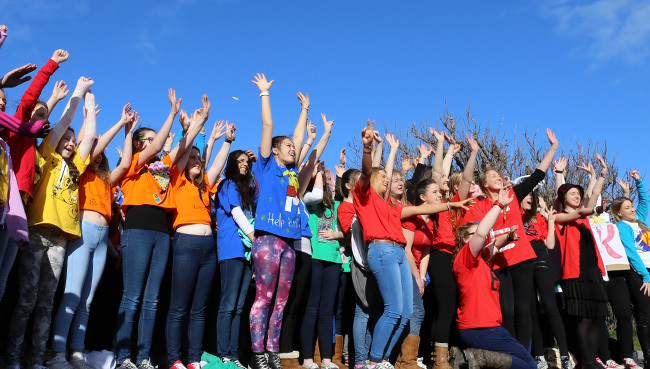 The First Year Sports Day took place on Wednesday. Great fun was had by all. The First Year retreat took place on Friday. The theme of the retreat was “Friendship”. It was preceded on Thursday evening by an input from Ms. Greene and Ms. Kenna. Transition Year students involved in the Gaisce Awards had their supervised hike in Carlingford this weekend. 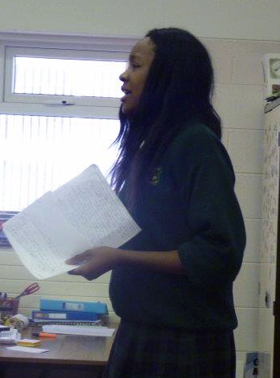 Oral Irish and practical examinations in Music and Home Economics took place this week. Oral French and German are being examined in the week beginning the 7th April. Music and Home Economics practicals are continuing. Congratulations to the ten students who have been accepted into the National College of Art and Design next year based on their outstanding portfolios. 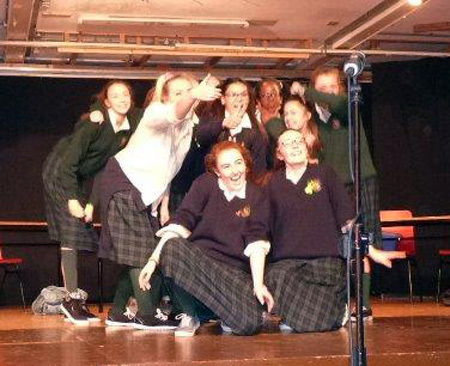 The Transition Year musical “Calamity Jane” is in full rehearsal. The production is on next week, Tuesday – Friday. Best wishes to the Transition Year students involved in the Mock Trial competition in the Four Courts. They are being supported by Ms. Barry and Mr. Daly. There have been lots of sporting activities this week. 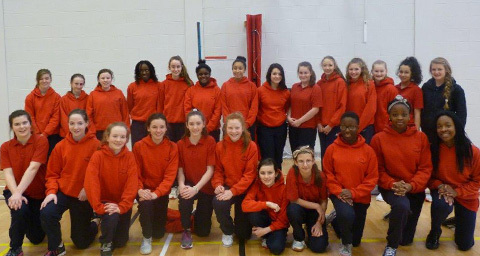 The U-14 Gaelic team narrowly lost to Colaiste Isogain, the U-14 soccer team had a home victory, while the junior camogie team were involved in the Loreto Camogie Blitz. Athletics training is ongoing in preparation for the summer events. 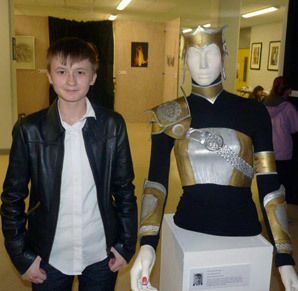 A wonderful Art exhibition entitled “On One Condition” was held on Thursday, 27th March. Fifth Year students based their thought provoking and visually effective pieces on their school visit to IMMA in October (Pics below). Well done to our Transition Year Sports Group for their great work in organising the Loreto Orienteering Competition on Wednesday. It was a brilliant day. Well done to the Gaelic and soccer teams on their matches this week. The U-17 soccer team now progress to the Dublin quarter finals. Transition Year musical rehearsals continue. Tickets for Calamity Jane go on sale next week. 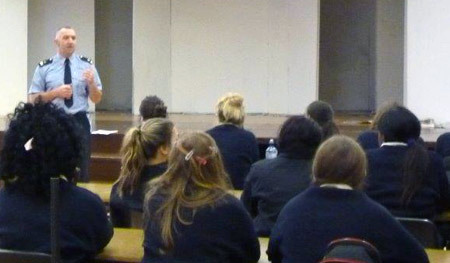 Sr. Gabrielle Murphy spoke to our Sixth Year students about Third level contacts for the next academic year. 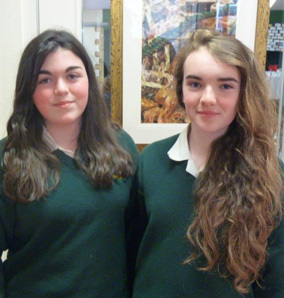 Congratulations to Diana Bura and Marie Louise Fufezan on winning the Sci Fest Junior Life Science Competition. 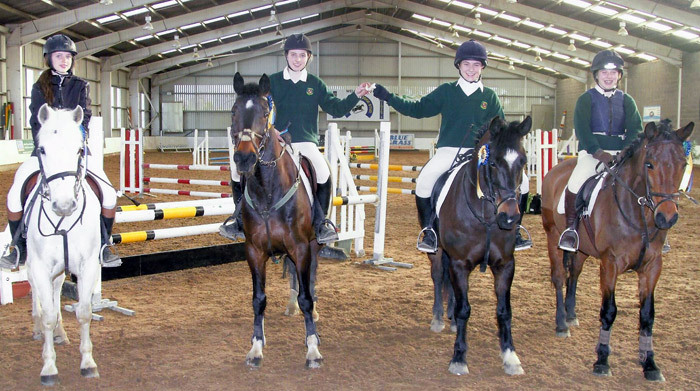 Well done to our Equestrian team of Ann Berg, Kate Murray, Ciara Murray and Aoife Keogh on their victory in Killossery Equestrian Competition. Transition Years had their annual bonding trip to Causey Farm. The girls experienced lots of rural activities and enjoyed themselves tremendously (pics below). Well done to the U.14 soccer team on their excellent victory during the week. 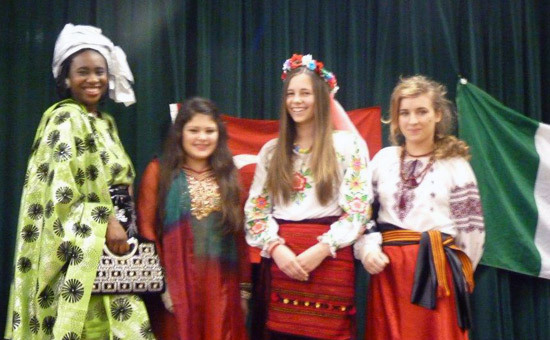 A wonderful Intercultural Day took place on Friday, 21st. It included a World Cup, sampling of traditional foods from around the globe and a display of traditional dress. The event was superbly organised by Ms. Ryan and her team of teachers and helped by the Intercultural Captains, Johanna Landu and Gulsah Aydin. The school golf team took part in the Leinster Schools Golf Competition on Friday, 21st March. Senior Geography students were involved in field studies during the week. The school is involved in the Writers in Residence programme. 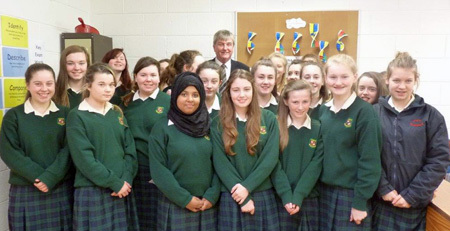 Author Seamus Cashman began his work with the girls this week. A variety of events took place for French week. They included First Year French breakfast, Second Year French Bingo, Third Year French Quiz, Transition Year French Projects and a French Film for senior classes. A History/German trip takes place this weekend to Berlin. Among the sites that will be visited are the Jewish Museum, Checkpoint Charlie, the Reichstag and the Sachausen Concentration Camp. There will also be a day trip to Leizpig. The second group of First Year students travelled to London this week. 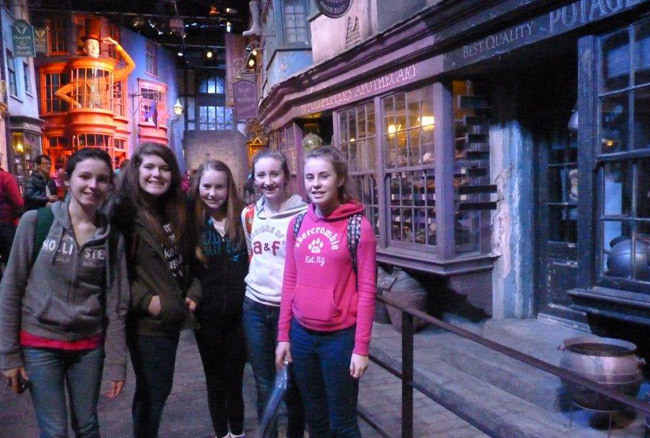 Similar to last week’s group the girls visited the Harry Potter studios and the Roald Dalh village. Well done to Sophie Donnelly, Alice O’Neill and Fiona Garvey on their excellent performance in the semi finals of the Leinster Debating Competition. Congratulations to Eibhlin McCarthy and Eryn Devine on their performance in the schools national cross country championship in Cork last weekend. 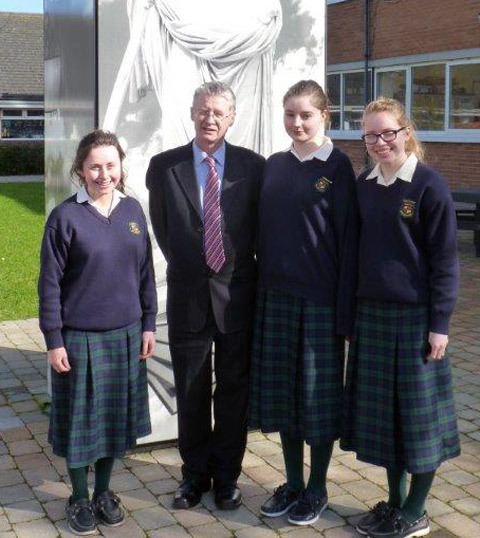 Congratulations to Nell Garvey (Irish) Ciara Palmer (French) and Rose Lattimore (German) on winning the Board of Management scholarship for their language subjects. Congratulations to Eilise Everard, Aoife Donnelly, Caoimhe Ryan, Emma McLoughlin & Molly McDonnell on their Gaisce Awards. A wonderful array of events took place for Seachtain na Gaelige. 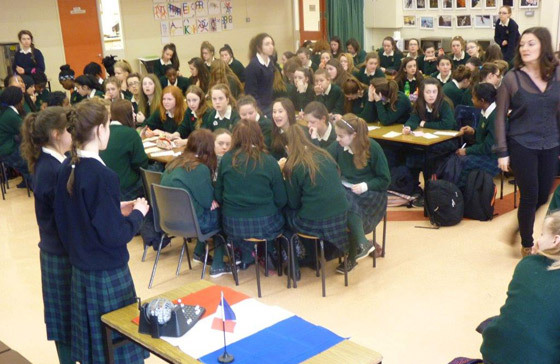 Amongst them were: Ciorcal cainte at lunchtime; Comórhas amhráinaíochta; Students performing traditional music; Quizzes. T.Y. 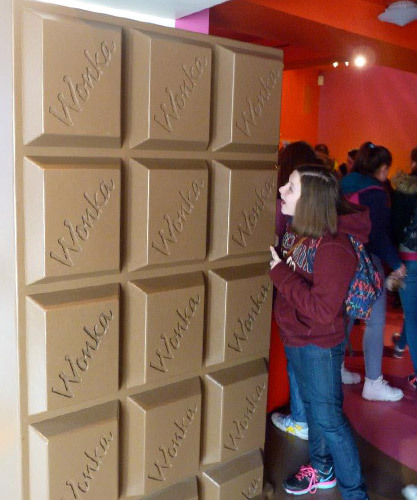 Home Economics students visited a sweet/chocolate factory in Carlow where they viewed and participated in sweet making. Congratulations to the following for winning the Balbriggan St. Patrick’s Day Art Award: 1st Diana Bura, 2nd Lucy Flanagan, 3rd Dagmara Dobkowska. Well done to our Transition Year team who participated in the Fingal County Council Enterprise Award. Their projects were “Mae Hand Sanitizers” which are alcohol based hand sanitizers with added scent. “Stick it Quick” produced stitch holders for wardrobes. 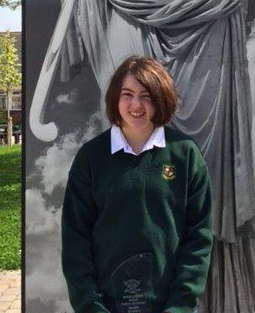 Best wishes to Nadia Grimes who is travelling to Abu Dhabi with the National Youth Orchestra for a St. Patrick’s Day concert. 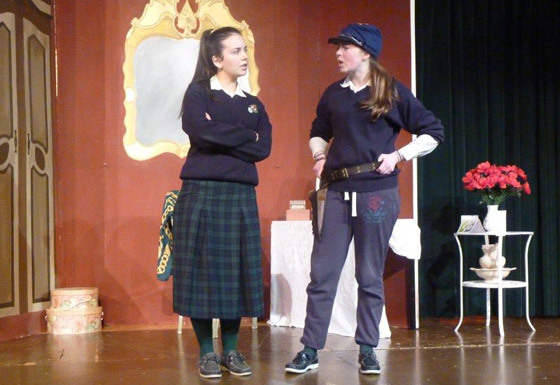 Rehearsals and scenery for the Transition Year musical ‘Calamity Jane’ are ongoing. Well done to the camogie team on their big victory on Thursday. Support parents in dealing with these issues. The school had a fantastic Rumbek Day on Friday, 7th. Well done to Ms. McHugh, Mr. Maguire and the Senior Prefects for all their great work. All funds will be forwarded to our sister school, Loreto Rumbek in South Sudan (Photo's below). The English Department organised a range of excellent activities for World Book Week. They included Drop Everything and Read, Book Quiz for First Years, “Where’s Wally” Book Search, The Big Bookmark Competition. 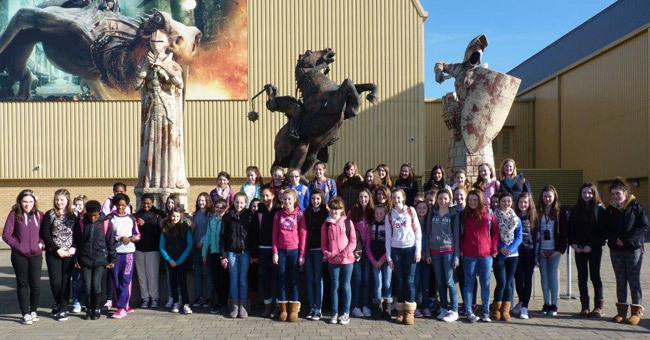 First Years had a day trip to London to visit the Harry Potter Studios and the Roald Dahl Museum and Village. 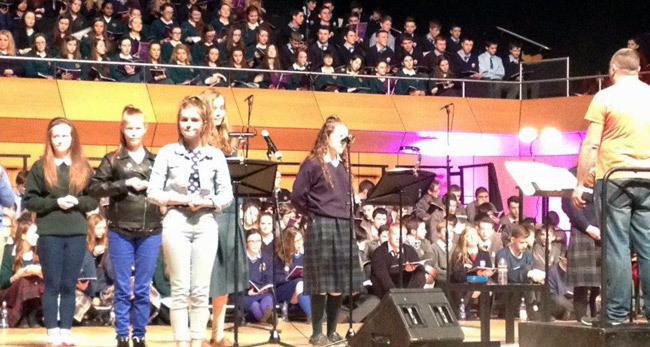 The school’s Senior Choir participated in the Emmanuel Concert in the Helix on Wednesday evening. They performed with over 20 other choirs in a marvellous evening. 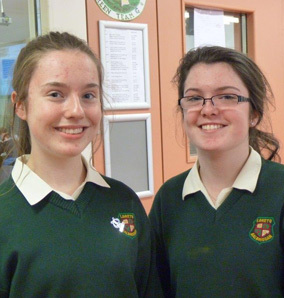 Well done to our Young Scientist students – Alice O’Neill and Cliona Farrell on participating in the Young Scientist Business Boot Camp this week. The 2C class visited the Dail this week as part of their CSPE studies. They were accompanied by Ms. Ferris and Ms. Morgan. Ashes were given to students and staff on Ash Wednesday. Accord gave Relationships and Sexuality talks to Transition Years this week. Fifth Years had a Mock Interview seminar this week. Well done to the hockey, football and volleyball teams on their performances this week. The hockey team lost their quarter final in a penalty shoot out while the soccer team won their match on a penalty. Aisling McBride and Naomi Clare scored the decisive penalties while Hannah McNulty saved three from the opposition. P.E. teachers and staff involved in extra curricular sports received CPR training (including Defibrillator training use) this week. Senior Year Music students attended the National Concert Hall to hear a live performance of their Leaving Certificate set works. Well done to our soccer, basketball and hockey teams on their performances this week. The First Year Basketball team won convincingly. The second year hockey team was defeated in their semi final after a penalty shoot out. 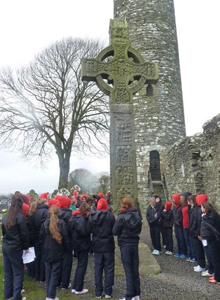 The First Year History trips to Monasterboice, Mellifont Abbey and Newgrange took place this week. 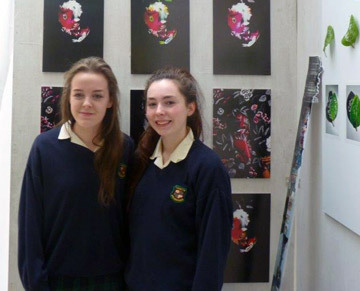 Transition Year Art students had a photography workshop this week. The Assessment Tests for incoming students, September 2014 took place on Friday, 28th February. 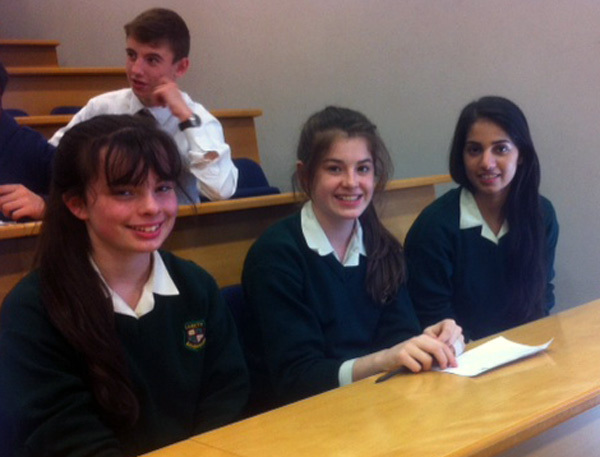 Well done to our students participating in the Leinster Debating competition. 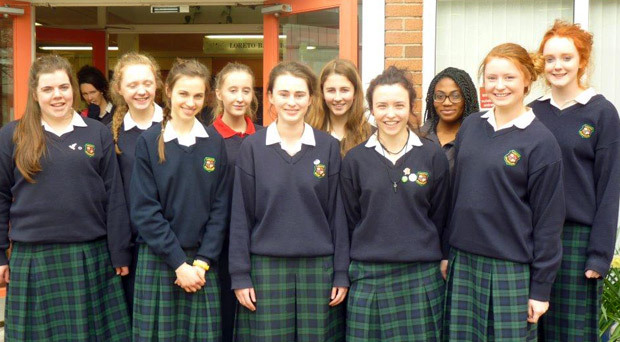 They are Niamh Egleston, Sophia Donnelly, Alice O’Neill, Eryn Devine, Fiona Garvey and Katelyn Conway McLaughlin. Sophie, Alice and Fiona have reached the quarter finals of this prestigious event. Congratulations to Seanna Guildea and Sarah Redmond on winning DCU Scholarship awards based on their excellent Leaving Certificate results. 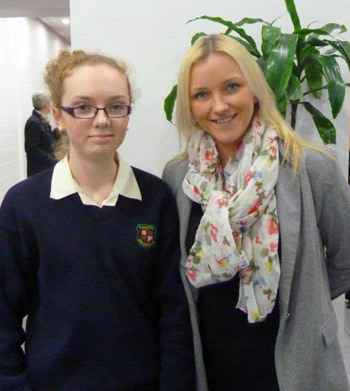 Seanna is studying Science in DCU while Sarah is studying Psychology. 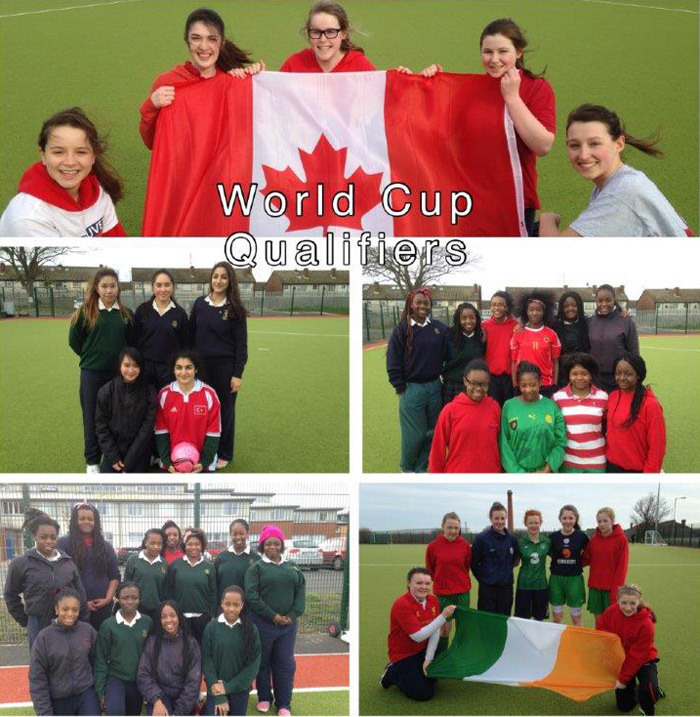 Assessment Test for Incoming First Years Sept 2014 will take place on Friday, 28th February from 1 p.m. – 3.45 p.m.
Well done to our second year Hockey team on their quarter final victory over St. Andrews. The semi final will take place after the mid term. Mock Examinations for Junior & Leaving Certificate students are completed. A First Year soccer blitz took place today. French and German scholarship exam took place this week. Transition Years remain on work experience placement. They are being visited this week and next by teaching staff. The Mock Examinations are in progress for Junior and Leaving Certificate students. 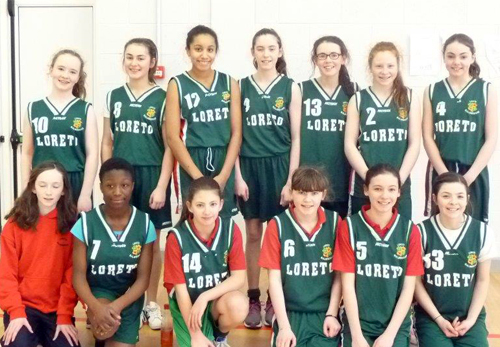 Well done to the First and Second Year Basketball team on their performance this week. The athletics team did particularly well in the Cross Country event in Mullingar. 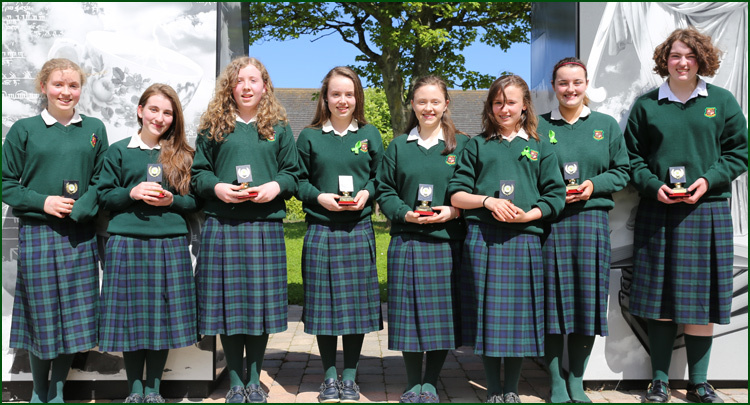 They are Eryn Devin, Orla Bollard, Eibhlin McCarthy, Lauren Murphy, Mairead Ni Chleirighm Orla Thompson, Saoirse Waddilove & Hannah Tully. A number of girls qualified for the final next month. 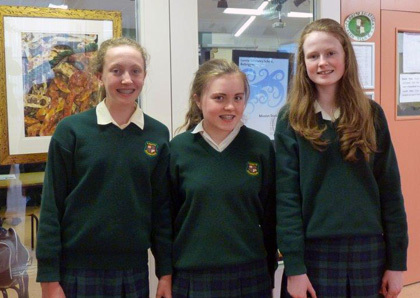 Well done to our four Transition Year students who have reached the semi finals of Doodle 4 Google. They are Stephanie Corrigan, Rachel Kelly, Victoria Savickaite and Megan Tucker. An excellent inter school debate between First and Second Years took place during the week on the topic of Crime and Punishment. 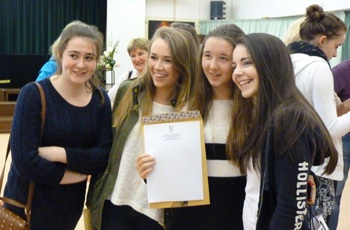 The Irish Scholarship examination took place during the week. The winner will receive funding towards a Gaelteach course. Well done to our two Senior Young Scientist winners. They have qualified for the Science/Business Bootcamp in U.C.D. in the next month. Well done to the First Year football team on their successful match this week. Congratulations also to First Year Gaelic team who reached the semi-finals in a Gaelic Blitz. Transition Year students are on the first week of their work experience placement. The school’s Teaching & Learning group worked with Conor Harrisson (PDST) this week. Mock Examinations will begin for Junior & Leaving Certificate students next week. 5th and 6th year Economics students enjoyed a presentation by Ms. Rowena Dwyer, Chief Economist with the Irish Farmers Association. Ms. Dwyer’s’ talk was quite inspirational as she discussed her career choices and experience to date. She provided much food for thought as she offered the many career options using a background in Economics. Ms. Dwyer studied pure Economics in T.C.D. and has had high profile roles within the Higher Education Authority, the Dept. of Education in Ghana and as a consultant with Price Waterhouse Coopers before taking on the role with the I.F.A. We greatly appreciated her time and interest. An excellent Mental Well Being Week took place in the school. A wide variety of events and activities occurred in order to promote mental well being. They included presentations by Jigsaw and Natalia Coyle, Olympic pentathlete. There was also an exciting Bowka – Dance the Alphabet session and an in school film for First Years. 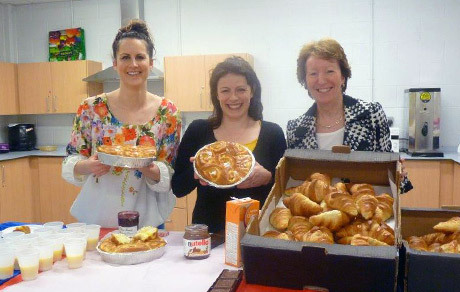 Other activities included daily affirmations, Face to Face talking and a Big Bake Competition. It was a major week also on the sporting front. 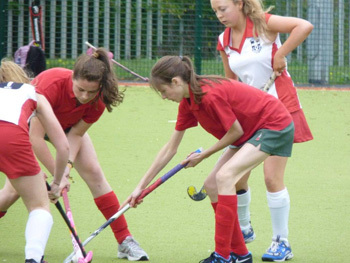 The First Year hockey team were narrowly beaten while the First and Second year Basketball teams had good victories. The First Year Spikeball team also had a good victory. Best wishes to the Under 15 soccer team in their Leinster quarter final and the senior Gaelic team in their Leinster semi-final. Transition Year exams occurred this week. The girls will be on work experience for the next three weeks. The First Year Parent Teacher meeting took place this week. 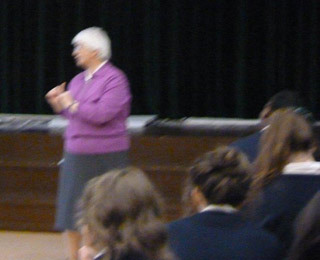 As part of the activities to celebrate Mary Ward Week Sr. Brigid Tunneygave a talk to students on Loreto missionary activities and Mary Ward’s life. 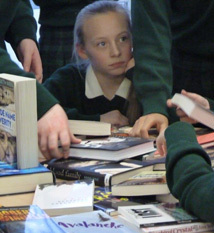 The Library received a range of books funded by last year’s Parents Association raffle. Congratulations to the Transition Year group who were involved in the Cycle Against Suicide Conference in the RDS yesterday. Over 4,000 students attended the conference which promotes mental health awareness. 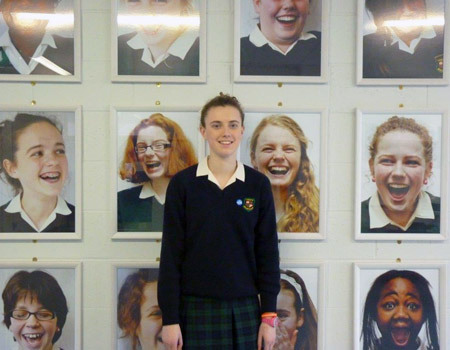 Aoife Kettle gave an input from Loreto Balbriggan on our “Wall of Smiles”. Well done to our hockey teams on their performance this week. 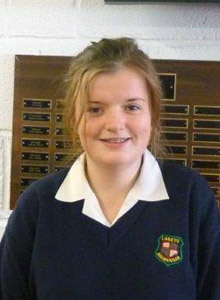 Congratulations to Cliodhna Redmond on being awarded D.C.U. Business certificate for one of the top Business scores in Dublin in the 2013 Junior Certificate. Best wishes to our senior Gaelic side playing their Leinster semi-final this week. Transition Year students had a talk on road and personal safety from the Gardai during the week. The 2nd Year Parent/Teacher meeting took place this week. Well done to Alice O' Neill, Cliona Farrell, Eibhlin McCarthy and Alix Buckley in the Young Scientist and Technology competition in the RDS, Dublin. 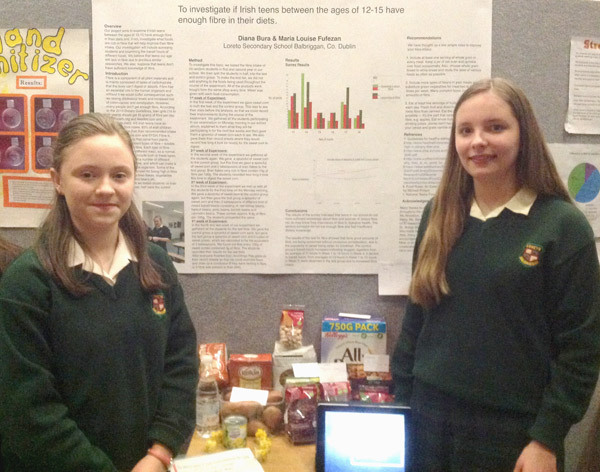 Alice and Cliona came 2nd in their group with a project on "Irish Aquatic plants; a solution for Pesticide Pollution". Eibhlin and Alix came 3rd in their group with a project called "Does the pitch of one's voice effect one's preference for other singing vocalists?" Best wishes to our students on the Music Trip to London. Students will be attending the Lion King and The Commitments. Other highlights include a trip to the British Museum, a guided sightseeing tour of London, the backstage visit to the Theatre Royal, Drury Lane and a lunch time concert at St. Martin in the Fields. 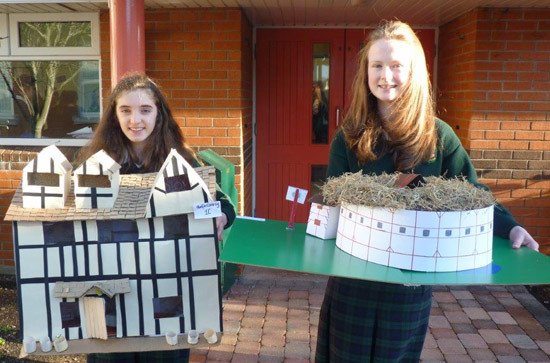 Well done to Ms. Davis’ First Year English class on their excellent Shakespearean models. Aware Talks continued this week as a lead up to Mental Well Being Week. Well done to the U-15 soccer team on their match against Marist College, Dundalk. Congratulations to the One Good Idea team, Regan Dunne, Christine Farrelly, Rachel Brennan and Shauna Byrne, who have reached the next round of the competition. Their project is titled “Teenage Flicks” which is a short film on the benefits of energy efficiency for teenagers. Transition Year students were involved in the Public Access to Law course on Tuesday. 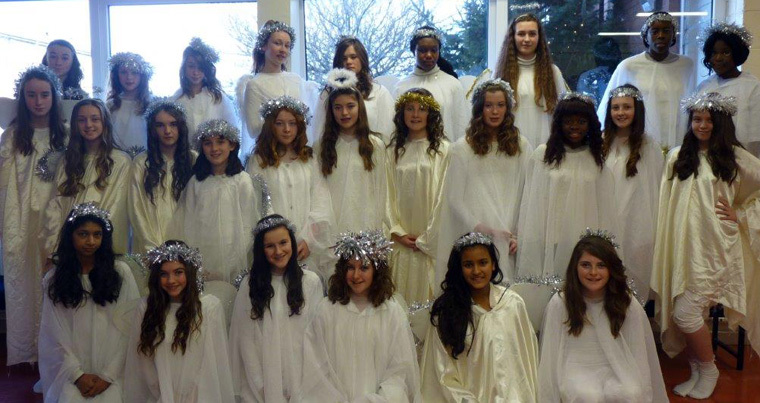 A beautiful Carol Service was celebrated in the school on Thursday, 19th December. Well done to all participants (Photo below). 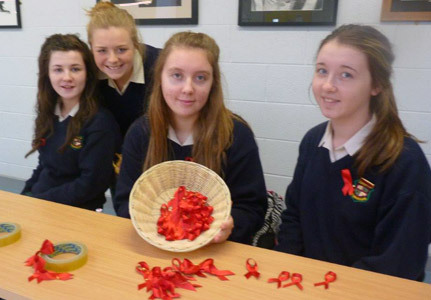 Sixth Years had Relationships and Sexuality talks this week. They were given by Accord. Well done to all the sports teams this week. 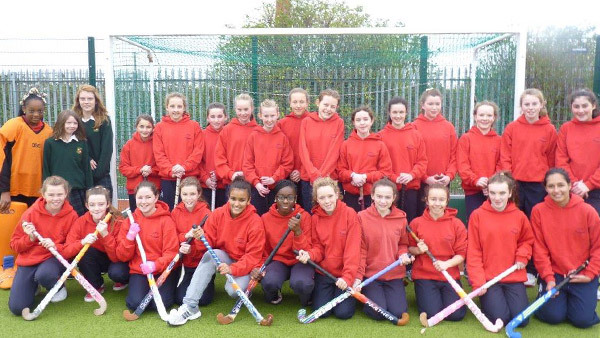 The Junior Hockey team have qualified for the next round of the Leinster League after their success on Wednesday. 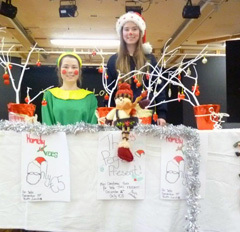 The German Weihnachtsfest annual Christmas celebration for the Junior German students took place on Wednesday. It included a quiz, a Christmas card and hat competition followed by a German movie. The Music Captains organised a wonderful concert on Thursday night for charitable causes. Amongst the excellent acts were Liz Seaver & Ryan O’Shaugnessy. Supervised Study will begin on Monday, 30th December for the week, excluding Wednesday, 1st January. 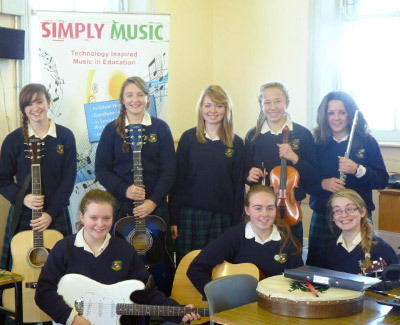 A wonderful Ceol Loreto Gig was held on Thursday, 12th December. Individual and group performances and Junior & Senior Choirs made it a Christmas night to remember. 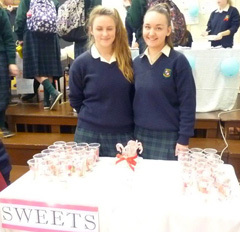 Transition Year mini companies had a fantastic Market Day on Friday in the school Assembly Hall. Thirteen different mini-companies produced such items as Organic Body Scrubs, Stick it Quick for Hairclips and Photo Albums were on display. 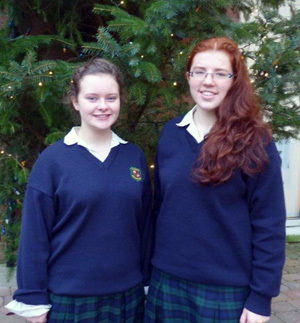 Two will be chosen to represent the school at the Fingal Enterprise Day. 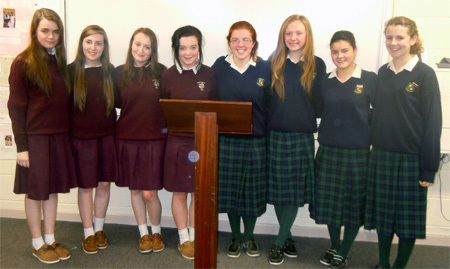 Congratulations to First & Fifth Year students who participated in the Loreto Mace Debates. 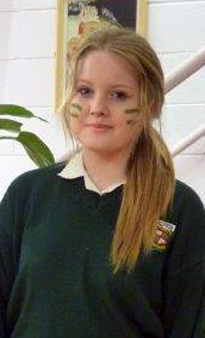 They were Lisa Rogers, Kathlyn Conway McLaughlin, Alice O’Neill and Fiona Garvey. Kathlyn and Lisa have qualified for the next round. Aware talks on Mental Well Being took place this week in the school. Transition Year History classes visited the Ann Frank exhibition in the Pearse Street Library. Transition Year students also attended the cinema to see the second part of “The Hunger Games”. This is part of their media studies. 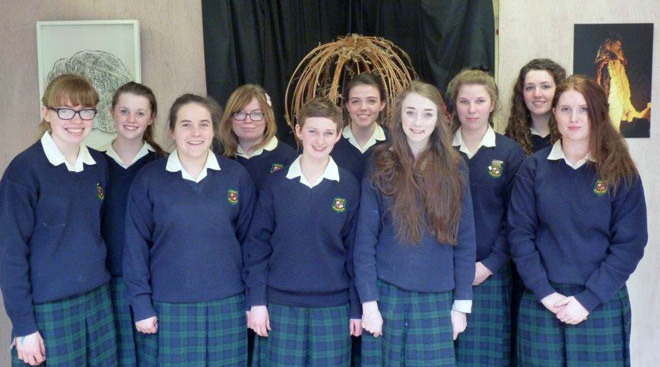 Transition Year students attended a German film and other Transition Years were on a week long Gael Linn course. 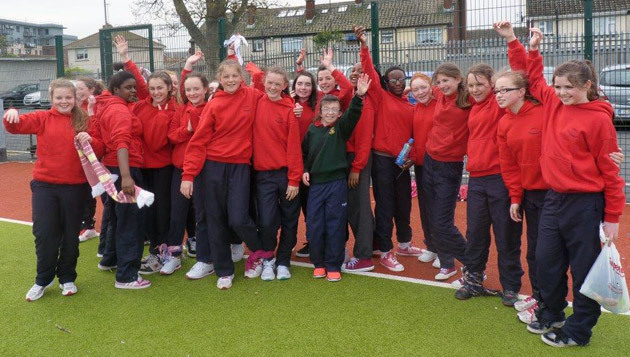 Well done to the Camogie, football and volleyball teams on their matches this week. The Concern Fast was most successful raising a significant amount for this worthy cause. Also, a big thank you to all who contributed to the St Vincent De Paul Food appeal. The donations were very generous and will have a positive effect on families in need this Christmas. Class 2C invited Mr. Brendan Ryan, T.D. to give them a talk on politics in Ireland and the work of the Dail. They thoroughly enjoyed it. 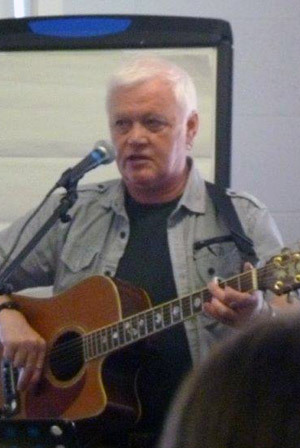 Mr. Alan Farrell, T.D. also visited the school to give a talk. 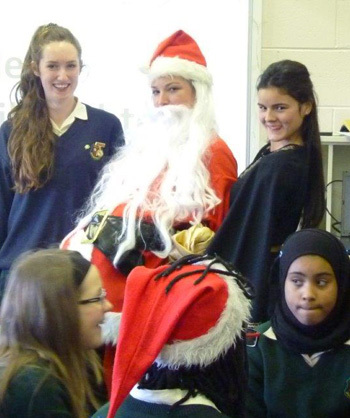 10 Transition Years were hostesses on the City Jet/Temple Street Santa Claus flight around Ireland last week. 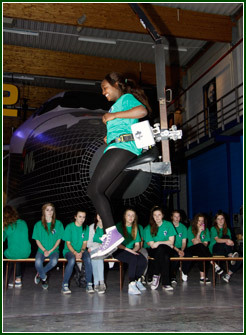 The girls were delighted to help the children on a wonderful experience for them. Trip to George Mitchell Conferral in D.C.U. Well done to the senior hockey and basketball teams on their matches this week. The various mini companies are up and running. There will be a Market Day in the school on December 13th. Well done to the Senior Gaelic team who have reached a Leinster quarter finals after their victory on Friday. 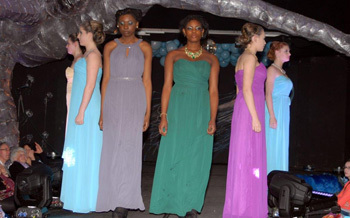 Rehearsals are continuing for the 10th anniversary Transition Year Fashion Show. 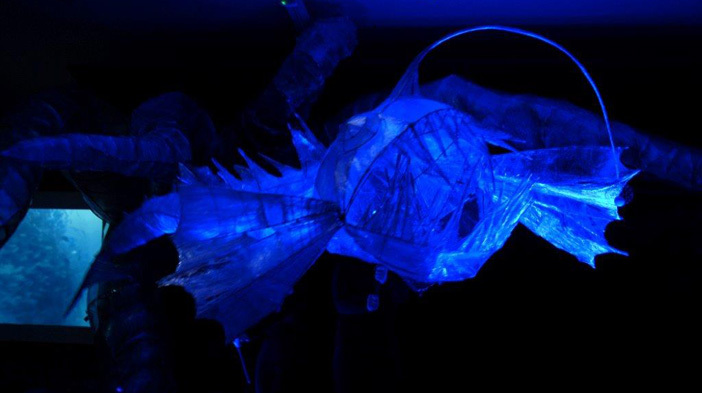 Wonderful creativity and style can be enjoyed on the night. For tickets contact Ms. O’Loghlen. Well done to past pupil and present student teacher, Rachel White who has just won the prestigious Society of Dyers and Colourists international competition. Rachel represented Ireland at the finals in India. Well done to the Senior French and German Debating teams this week. 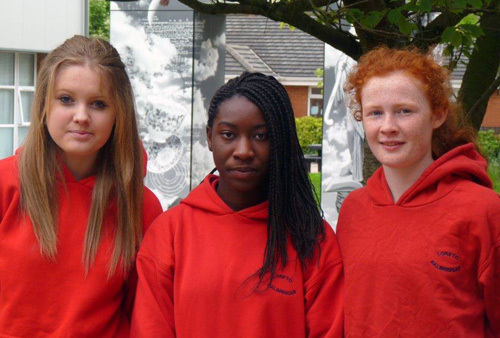 The French team were Niamh Egleston, Aideen McNally, Hannah O’Connor and Megan Weston. The German team (below)were Aine McCarthy, Andrada Pop, Katelyn Conway McLaughlin and Eryn Devine. 2nd Year Senior Prefects organised a lunch for 2nd Years in the Atrium today. 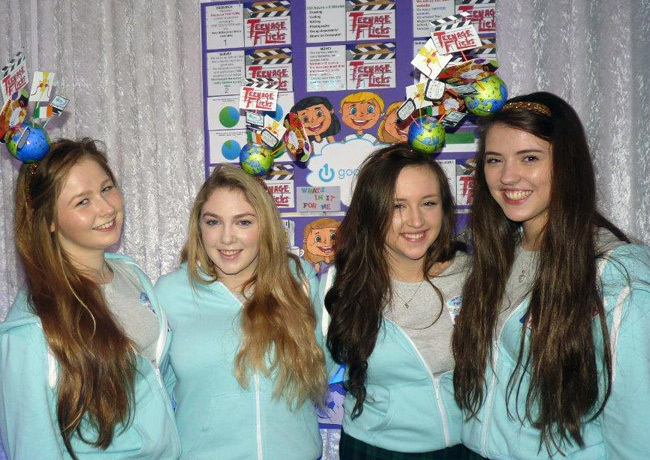 Best wishes to Tilly Butterly & Aisling McBride on their marvellous Bayer sponsored project, “Pumped”. The girls investigated the effects of cholesterol on teenagers. They examined the science surrounding cholesterol before filming a 90 second advertisement. Today is World Aids Day and the Justice, Peace and Integrity of Creation group helped raise awareness with a number of initiatives. Well done to both sides in the basketball quarter finals. The Seniors have reached their semi final. 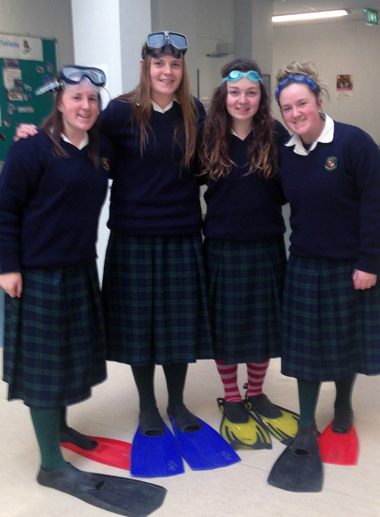 Sixth Year students attended “An Trial” as part of their Leaving Certificate course work. Best wishes to Erica Ruigrok who is participating in Olympic linked sailing events in the Canaries next week. 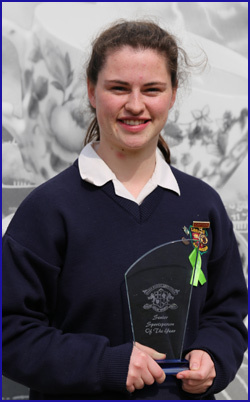 Erica is a member of the Leinster Squad and competes in the Laser Radial class. Our past debating captains, Aisling Duff and Eimear Gorey helped prepare our Second Year team for the upcoming Mace Debates. Well done to our football, hockey and basketball teams on their excellent performance this week. “Happy Feet Day” – a fundraiser for those affected by the typhoon in the Philippines was held on Friday. All students wore colourful footwear/socks and in turn donated monies to the Disaster Fund. 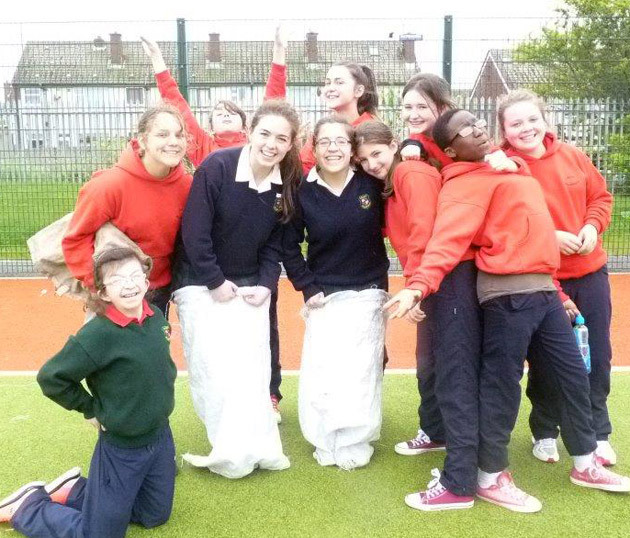 A group of girls are participating in the Fingal County Council sponsored after school Judo. Well done to Sarah McMahon for helping organise this. Well done to all involved in yesterday’s swimming gala. Maeve Cope won a silver medal in the breast stroke. 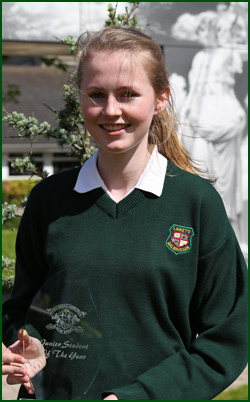 Well done also to Katie Dinsmore who was picked for the Leinster Development Hockey squad. 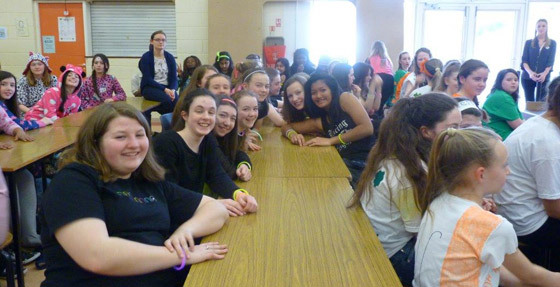 A lunch for new girls to the school between 2nd/6th Year was held during the week to especially emphasise their welcome to Loreto, Balbriggan. A wide range of wonderful and interesting events took place for Science Week. 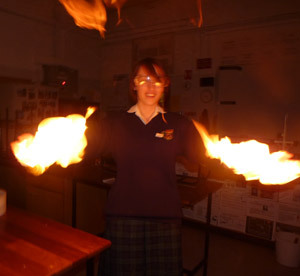 Sixth Year Science Captain, Megan Weston, gets all fired up for science week. Students had science related career talks from a variety of speakers. There was a competitive science quiz for 2nd Years. Transition Year students visited Merck Pharmaceuticals. On Thursday and Friday a Science Club and Science shows were very popular. Well done also to both teams participating in the ISTA Senior Science Quiz. 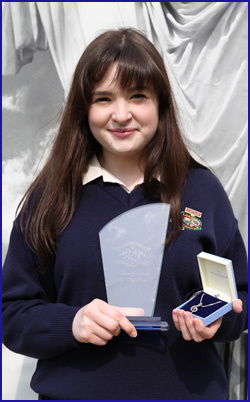 Loreto Secondary School, Balbriggan was the top scoring Loreto School. Rehearsals for the T.Y. Fashion Show are ongoing. 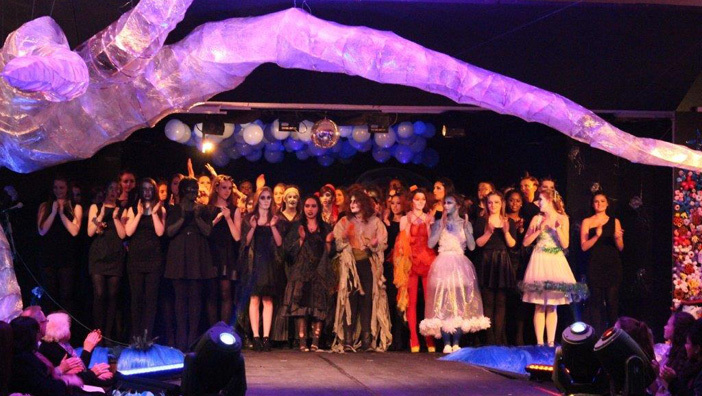 In addition to costumes from various outlets, the girls will also display their own stunning creations. 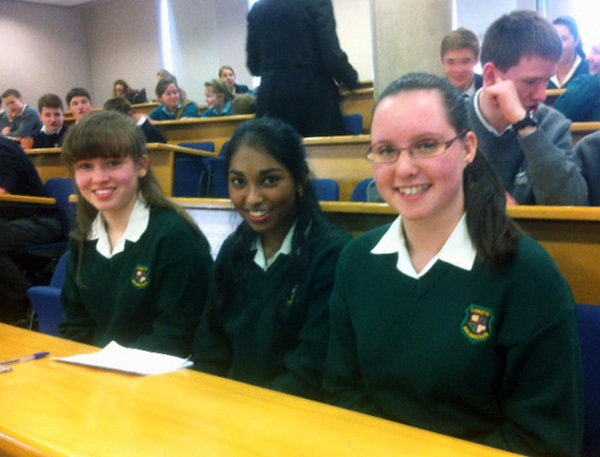 Congratulations to both senior and junior Irish debating teams who qualified for the next round of debates. 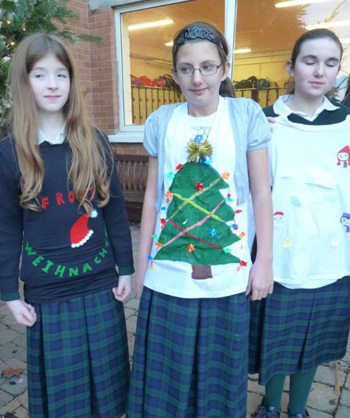 The Junior team are Tess O’Neill, Kelly Murphy and Renuka Chintapalli. 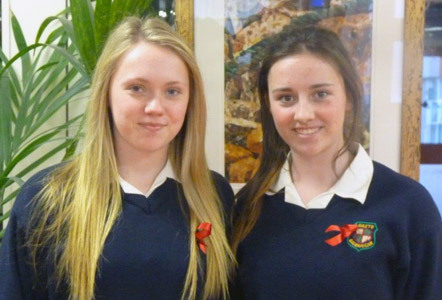 The Senior team are Alice O’Neill, Rachel Taylor and Fiona Garvey. 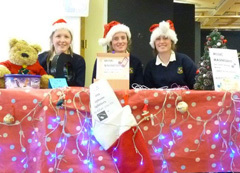 Well done to Sarah Parker, Sarah Keogh and Sally Bentley for organising the Shoe Box Appeal. The school is involved in the Sky Sports sponsored programme “Living for Sport” whereby students not usually involved in sporting activities are motivated to do so. Olympian, Natalia Coyle, is working with some Loreto students. which is an online computational thinking challenge for students. 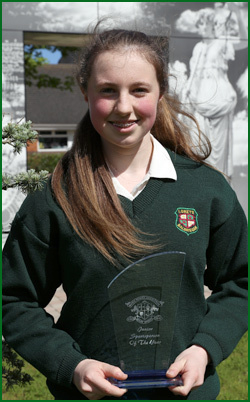 Cliodhna was chosen for the competition based on her especially high achievement in Mathematics in the Junior Certificate examination. Well done also to Abby O’Regan who won an iPad after her successful science quiz performance on the Hector Breakfast Show. Congratulations to the Equestrian team on their 1st place last weekend. Well done to the G.A.A., Basketball and hockey teams on their performances this week. Fifth Year students visited the Irish Museum of Modern Art on Friday. 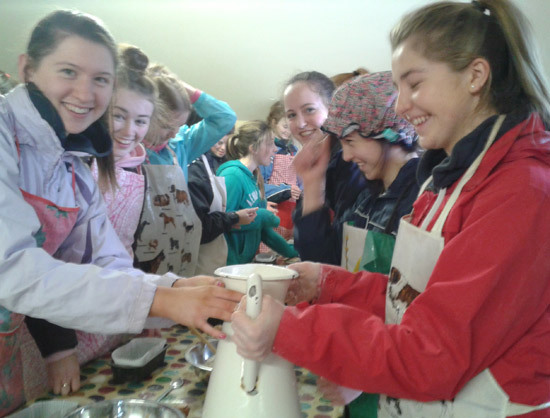 37 Fifth Year students attended a Food Science workshop in Teagasc on Friday as part of Science week. 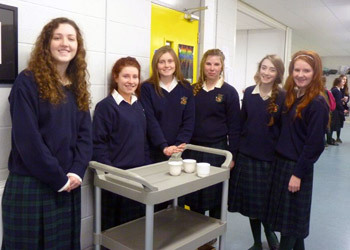 The students attended a variety of innovative food science workshops. 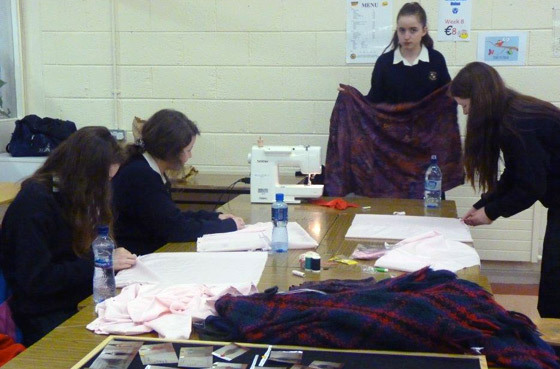 The content of the workshops were all closely linked to the Leaving Cert Home Economics syllabus and students thoroughly enjoyed the experience. A beautiful Taize Remembrance Evening took place on Thursday, 7th. Music, Poetry and images helped those gathered to remember their loved ones. Well done to the students who received upgrades in their Junior Certificate. Best wishes to the students involved in the Leinster Debating Competition. 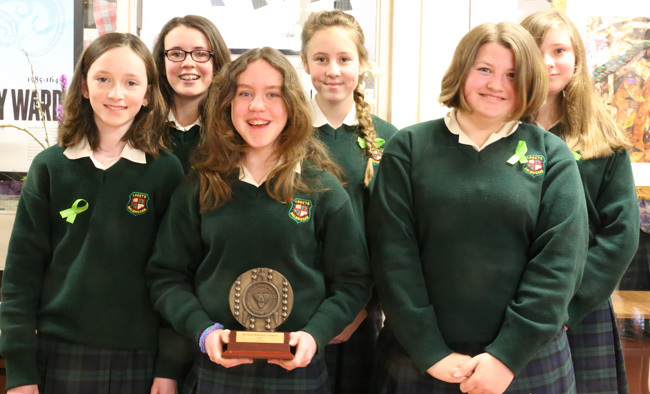 They are Sophie Donnelly, Niamh Egleston, Fiona Garvey, Alice O’Neill, Serena Oster, Laura Hennelly McCarthy, Katelyn Conway McLaughlin and Eryn Devine. Transition Years are enjoying a brilliant music workshop focusing on Music and Technology. 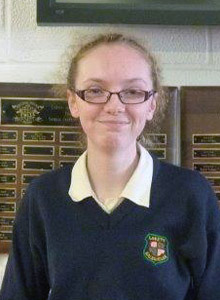 Congratulations to Ciara Lattimore who was awarded an Entrance Scholarship to N.U.I. 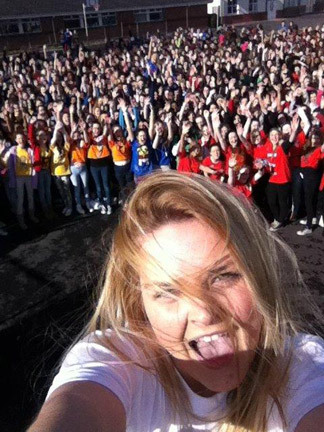 Maynooth based on her Leaving Certificate, 2013. Best of luck to the Equestrian team on their competition this weekend. 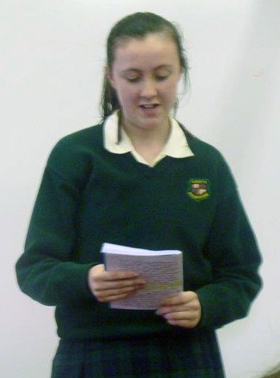 Well done to Hannah Rudden, whose short story is published in “Paws for Story Time” this weekend. Funds raised goes to Our Lady’s Hospital, Crumlin. Hannah is a member of the Megan Wynne Creative Writing Group. 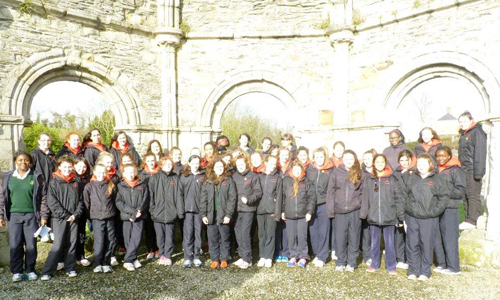 Retreats took place this week for 2nd and 4th Years. They were facilitated by Mr. Gerry Keegan. 6th Year P/T Meeting 1.30- 4 p.m.
All students finish class at 12.40 p.m.
3rd Year P/T Meeting 12.50 – 3.20 p.m.
All students finish class at 12 noon. 4th Years had a two day photography course with Tim Durham. 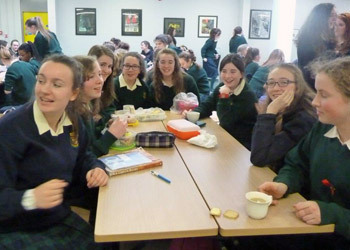 5th and 1st Years enjoyed a twinning lunch on Monday in the hall. Well done to all who participated in various sporting events during the week including G.A.A., volleyball, hockey, Futsal and soccer. 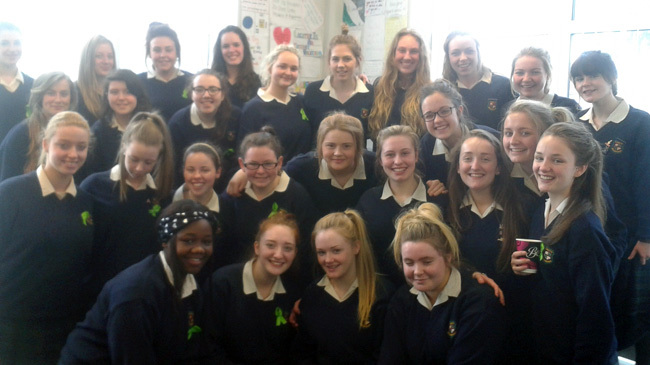 6th Years had their week of guided prayer facilitated by the Loreto Sisters. 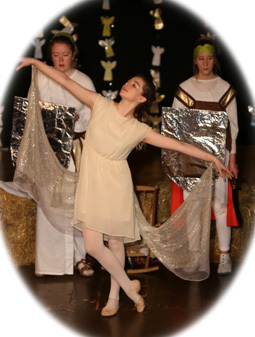 The 4th Years put on wonderful performances during the Shakespeare festival. Well done to 4A who took the top accolade. The parents association organised a very successful careers fair during the week. Gig/Music week. 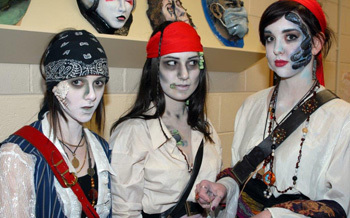 The Halloween Ceol Loreto Gig took place on Thursday, just one of many events organised during Music week. The science department and a group of 4th Years are on a trip to Belgium. The first years had an assembly to mark the end of their first half term. They were all given goodie bags packed with treats to help them relax over the mid-term break. Well done to all the 5th Years and the P.E. Department for a wonderful display of fundraising at its best during the run-a-mile challenge on Balbriggan Beach. Eilise Everard took away the accolade of first place and ran a great time (Pic below). 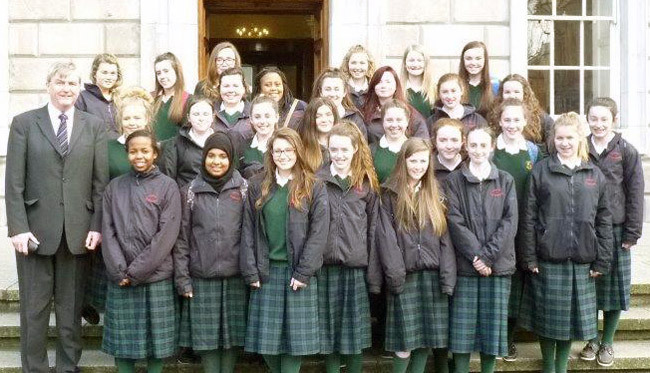 The 6th Years went to IMMA for a trip which inspires their work throughout the year. The school enjoyed success in both German and French debating. 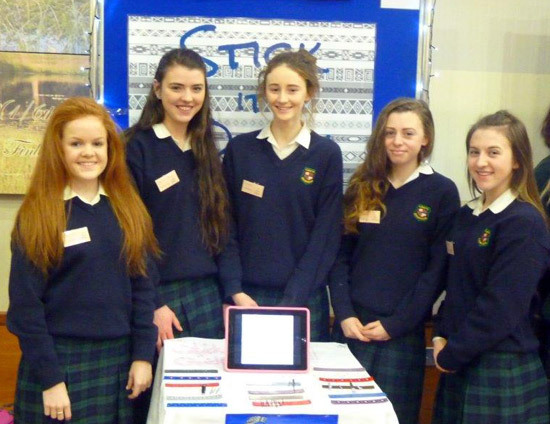 6 new members of the student council attended a conference in Croke Park organised by the Loreto Education Office. The day was a great success. The business department senior students flew to Dusseldorf for a packed few days visiting businesses and the stock exchange. 4th Years went on a Horticultural trip to the National Botanical gardens. Careers speakers were in to talk to 6th Years. 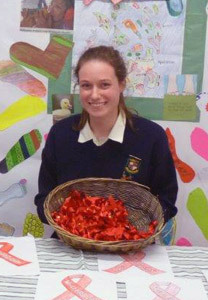 There was great excitement in the school on Friday as we welcomed back past pupil Grace Davitt. Grace was part of the 6 Nations Ladies Cup winners team. She gave an inspirational speech to students on the importance of sport in all walks of life. Congratulations to Ciara Lattimore on winning an Entrance Scholarship to NUI Maynooth based on her Leaving Certificate results. Senior Prefects participated in leadership training on Monday afternoon. The training was run by Ms. McHugh and Mr. Maguire. First Years participated in a fire drill during the week. The French Theatre company put on a drama for second and fourth years in the school on Wednesday. 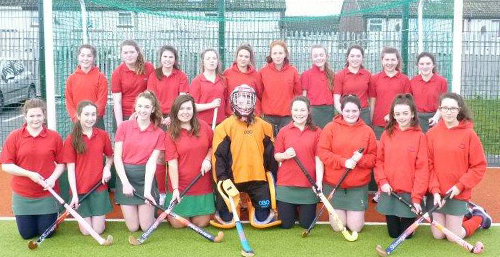 Juniors, minors and senior hockey teams performed well in their matches against Mount Anville this week. Volleyball Cadettes won their first match of the season. 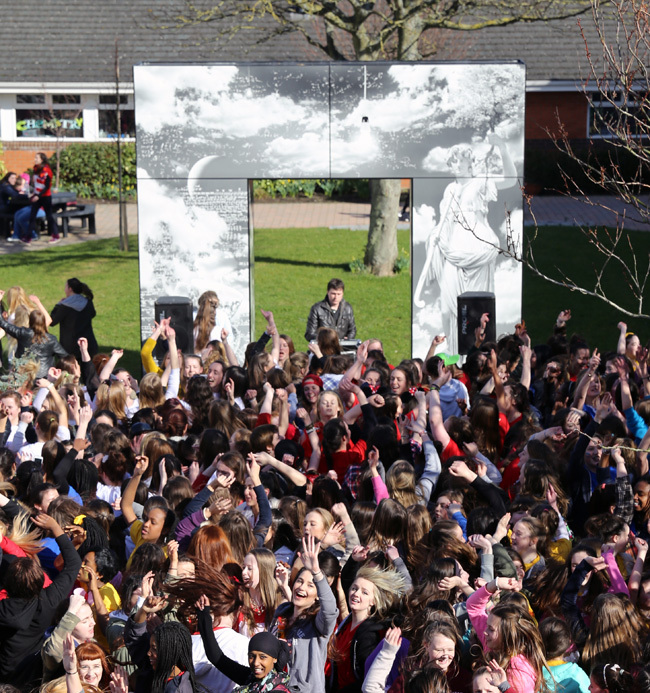 Transition Years had their annual blessing for the year ahead. Ms. Kenna organised the blessing. Well done to all who participated in the Athletics cross country event in Santry Park and Demesne. 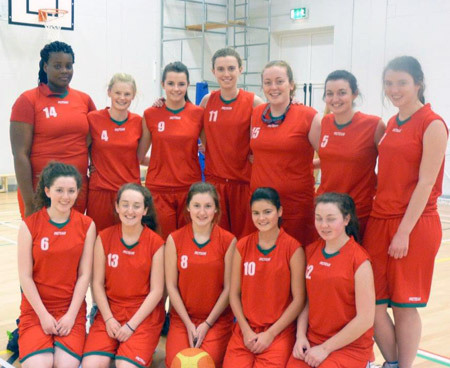 The Cadette Basketball team played a match against Malahide and won. Seniors were narrowly beaten. An Information Evening for the the parents of the TY students going on the science trip to Belgium will take place on Monday, 14th October at 7 p.m. They should be accompanied by their daughter. Well done to Nadia Grimes on her various musical achievements. 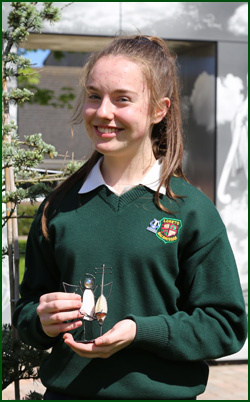 Nadia won junior woodwind rosebowl and the Doris Keogh Cup in the Feis Ceoil. 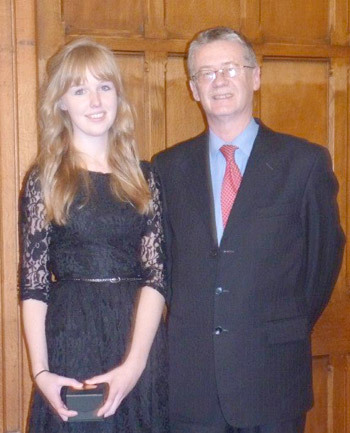 Consequently, Nadia performed in a gala concert in the National Concert Hall as part of the Feis Ceoil Association. Well done to the school’s volleyball team on their matches against Santa Sabina. Well done to the First Year Gaelic team on their victory during the week. The T.Y. Horticultural module organised a Harvest Festival. Monies raised went to Pieta House. A number of hockey teams had matches this week. Third Year Geography students are on their field trip to the Burren this weekend. Transition Year Photography workshops took place this week. It was facilitated by Tim Durham. The HPV vaccinations took place. The Parents Association A.G.M. met on Tuesday evening. The guest speaker was Sheila O’Malley, Practical Parenting. Congratulations to Aoife Phillips and Rachel Taylor on being part of the victorious Laytown/Bettystown Gold team that won the prestigious I.L. G.U. senior Foursesome. It is a great achievement for the girls. The Stratford-on-Avon trip for 3rd Years was a wonderful success. Transition Years had an adventure visit to Kippure, Co. Wicklow. Well done to the hockey and soccer teams on their matches during the week. Random Selection for places in First Year 2013-14 took place on Wednesday, 25th September. T.Y. students took their D.A.T.S tests which will be helpful in their college choices. Sixth Year students attended the Higher Options course, also to help with college choices. Transition Year classes took a photography course with Tim Durham. 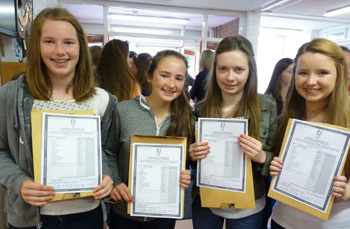 Congratulations to all our Transition Years on their wonderful Junior Certificate results. Well done to Aoife Phillips and Rachel Taylor on reaching the All Ireland Final – Miele Four Ball golf - with their club Laytown/Bettystown. 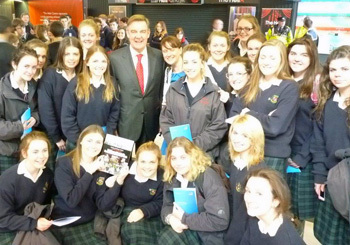 Information Evenings for incoming First Years were held on Monday and Tuesday. Prospective students and their parents received a guided tour of the school from senior prefects. A meeting of parents for students going on the Stratford trip was held on Thursday evening. Well done to the senior and junior hockey teams on Thursdays first league matches on the new Astro Turf pitch against Holy Faith, Clontarf. T.Y. 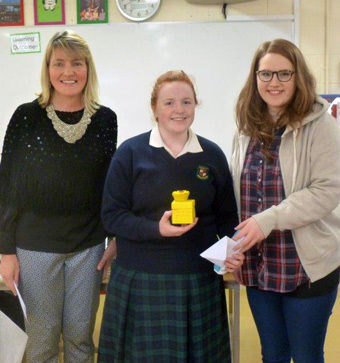 Business students had a talk and presentation from the Fingal Enterprise Board in relation to mini companies. News update, Sept 6th, 2013. Senior Prefects received excellent training from Shane Martin who is one of Ireland’s top motivational speakers and an expert on positive psychology. A beautiful Mass to celebrate the opening of the school year occurred on Friday, 6th September. Fr. Eugene Taaffe celebrated the mass which was held in the school sports hall. After the mass student leaders were commissioned for the 2013-14 academic year. News update, Aug 30th, 2013. 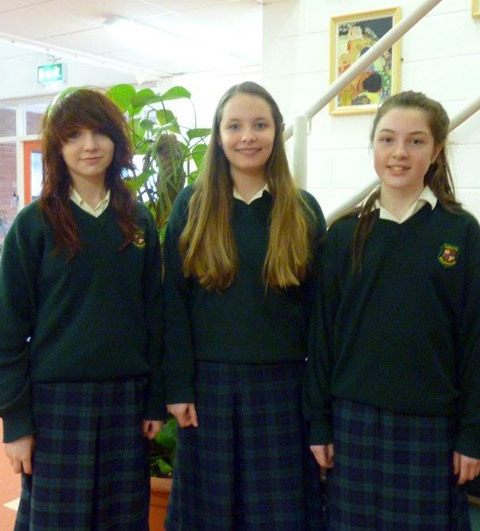 We welcome all new students and staff to Loreto, Balbriggan for the 2013-14 school year. First Year students had an orientation programme to help them get settled into school life. 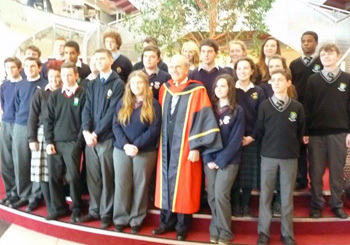 A twinning programme was also established, whereby all First Years were twinned with a Fifth Year student. 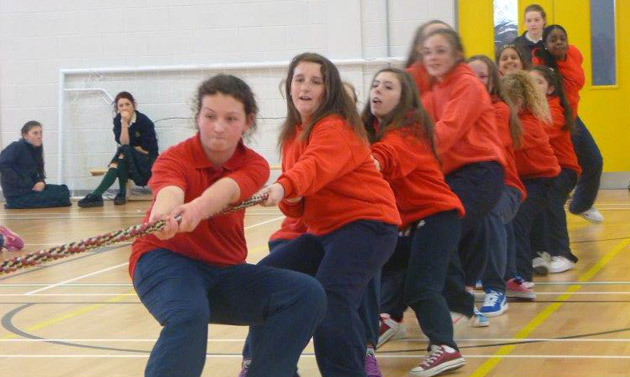 On Friday all First Years enjoyed a Sports afternoon where the girls had a taster of a range of sports.